If you’ve been injured in a car accident in Phoenix, you can expect the medical bills to start rolling in pretty quickly. Depending on your injury, these bills could be quite substantial. You probably have a lot of questions. How will these bills get paid? Whose insurance company is responsible—yours or the person who caused the accident? If your health insurance pays those bills, will you have to pay them back? This is a lot of confusing information to digest when you’re trying to recover from an accident. The short answer here is that the medical bills are your responsibility. Even if the car accident wasn’t your fault, don’t be tempted to let your bills languish until your case plays out in court or arbitration. The hospital or healthcare provider will be looking to you to pay the bills, and if they’re not paid promptly, you run the risk of them being sent to a collection agency and your credit could take a hit. Won’t the other driver’s insurance pay my medical bills? 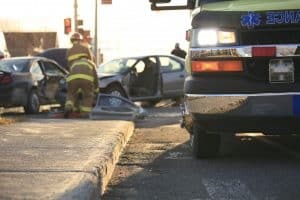 If the other driver is found to be at fault for the crash, any settlement money you get from that driver will go towards satisfying your medical bills. However, the other driver’s insurance is not required to directly pay the healthcare providers up front. Rather, the money you may receive at the end will be used to either (a) pay the healthcare providers, or (b) reimburse you for payments you’ve already made. But this can take a while, and you don’t want those bills to pile up and sent to collection. There are other reasons to protect yourself as well. Hospitals are increasingly trying to profit from patients’ injury claims, and they do this by billing your car insurance rather than your health insurance. This maximizes the amount of money the hospital can bill, but reduces the amount of money you can collect in your case. To protect your claim, keep these important points in mind. Don’t give the hospital your car insurance information. As you know, when you’re admitted to the hospital, you sign a lot paperwork. One of these is an “Assignment of Benefits” form. If you give the hospital your auto insurance info, they’ll use that to bill the car insurance directly. This can reduce the amount of money you can collect in your case. Even if the hospital pressures you for your car insurance information, you are NOT required to provide that information. Provide your health insurance information only. You’re only required to provide your health insurance to the hospital. Even if they tell you that your insurance won’t honor your claim, this is untrue. Health insurance will honor the claim and seek reimbursement from a future settlement. Reimbursing the health insurance company is cheaper than paying the hospital the full amount for their bill, which leaves you more money to keep from your settlement, and also prevents the hospital from filing a hospital lien (going after your settlement for the balance of your bill). In other words, if your health insurance doesn’t pay the full claim, you are not on the hook for the balance – and neither is your auto insurer. In fact, if you do not have health insurance, hospitals are required by law to bill you the same as they would an insurance company. This was recently backed up by Ansley v. Banner Health, which went to the Arizona Supreme Court, who found for the patients. When you’ve recovered from your injuries as much as medically possible, it’s time to settle your claim. That’s when you submit the full amount of your medical bills in your settlement demands. Even though your health insurance covered these bills, you’re entitled to the full amount, as your health insurance will likely seek reimbursement from your settlement. Accident claims can be more complex than they seem at first glance. It’s crucial to speak to an experienced personal injury attorney to ensure you receive maximum compensation for your injuries. At Plattner Verderame, P.C., our Phoenix car accident attorneys work tirelessly to protect the rights of our clients. We’ll help you break through the red tape of insurance companies and medical providers, keeping your best interests in mind. Contact us today by calling 602-783-8793 or filling out our contact form.